By Nirav Shelat, D.O., D. Lee Bennett, M.A., M.B.A., M.D. In Figure A, the radiographic diagnosis of atlanto-occipital dissociation (AOD) was made and confirmed on computed tomography (CT, B). What objective criteria are used to establish this diagnosis? AOD, also known as craniocervical dissociation, results from disruption of stabilizing ligaments at the skull base and typically occurs in the setting of high-speed motor vehicle accidents (MVAs).1 Ligamentous disruption results in anterior/posterior dislocation of the skull or vertical distraction. Although AOD is usually fatal or catastrophic, early recognition and prompt atlantoaxial fixation have led to improved outcomes. Although AOD may be readily apparent on lateral radiographs of the cervical spine, routine use of CT in trauma has allowed for more precise measurements. 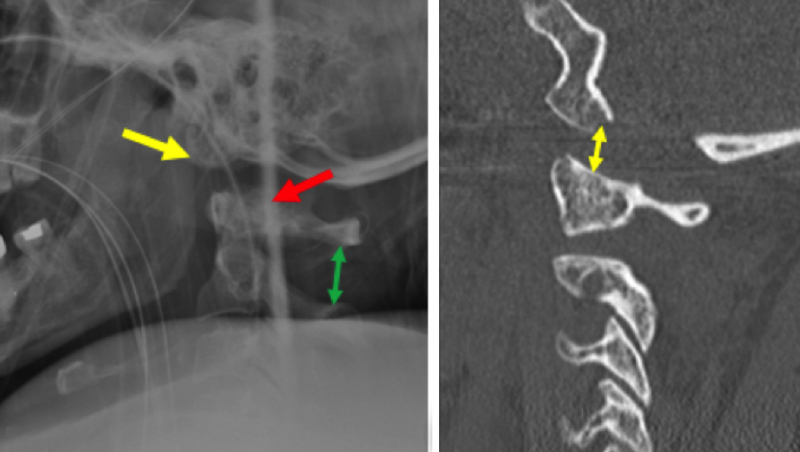 The lateral radiograph in this patient following a high-speed MVA demonstrates anterior dislocation of the skull (yellow arrow, A) with respect to the cervical spine (red arrow, A). There is also significant increase in the C1-C2 interspinous distance (green arrow, A). Chang W, Alexander MT, Mirvis SE. Diagnostic determinants of craniocervical distraction injury in adults. Am J Roentgenol 2009; 192(1):52-58. Shelat N, Bennett DL. At the Viewbox: Atlanto-occipital Dissociation. J Am Osteopath Coll Radiol. 2016;5(4):27. Nirav Shelat, D.O., D. Lee Bennett, M.A., M.B.A., M.D. Dr. Shelat and Dr. Bennett are with the Division of Musculoskeletal Radiology, University of Iowa Hospitals & Clinics, Iowa City, IA.